What is a "Neighbor Letter"? Want to Use My Neighbor Letter Template? Get properties under contract and flip them for a profit as soon as possible. Obviously, this is the ideal outcome every real estate investor is looking for, but how exactly are YOU planning to do this? After all, it's easier said than done. Obviously, some actions will be much more effective than others – but there is one particular action I've learned to take that wasn't obvious to me at first (and I suspect it probably isn't obvious to a lot of people). When my intent is to sell a property ASAP, there is one thing that I NEED to do immediately after I take possession of a property. Priority #1 is to send out letters to all the neighboring property owners. 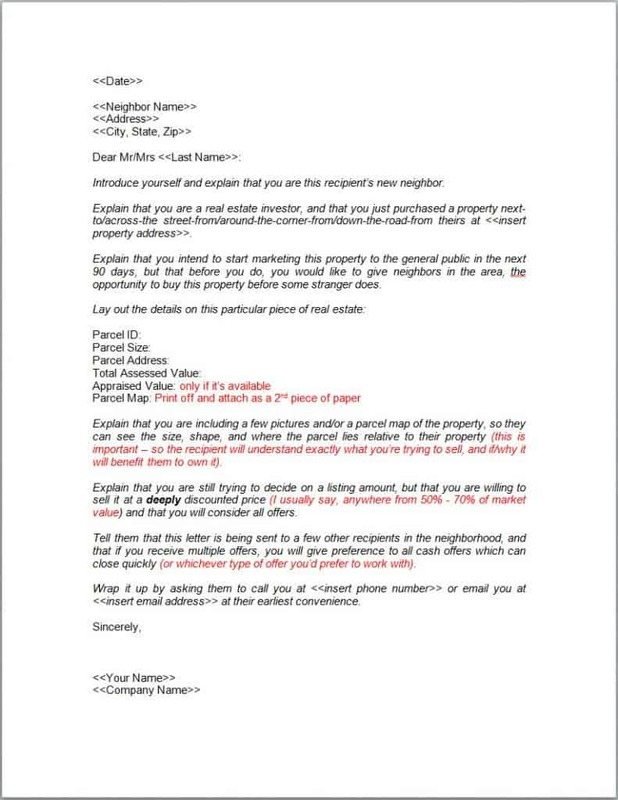 What Is A “Neighbor Letter”? I am the new owner of this property – which (in most cases) adjoins to theirs. I intend to sell this property to someone in the very near future. This has been a stunningly successful technique for me because in a lot of cases, I've found that there are a number of neighboring property owners who would absolutely LOVE to buy the land or house next-door to them if they were only given the chance. In my case, I am almost always buying properties free and clear for 10% – 30% of market value, which makes it extremely easy for me to work with any buyer (whoever they are) and give them the price AND terms that they want. Because I buy properties for such a low price, I usually have a large profit margin to play with, which allows me to sell the property for a very low price AND pocket a nice sum of cash in the process. 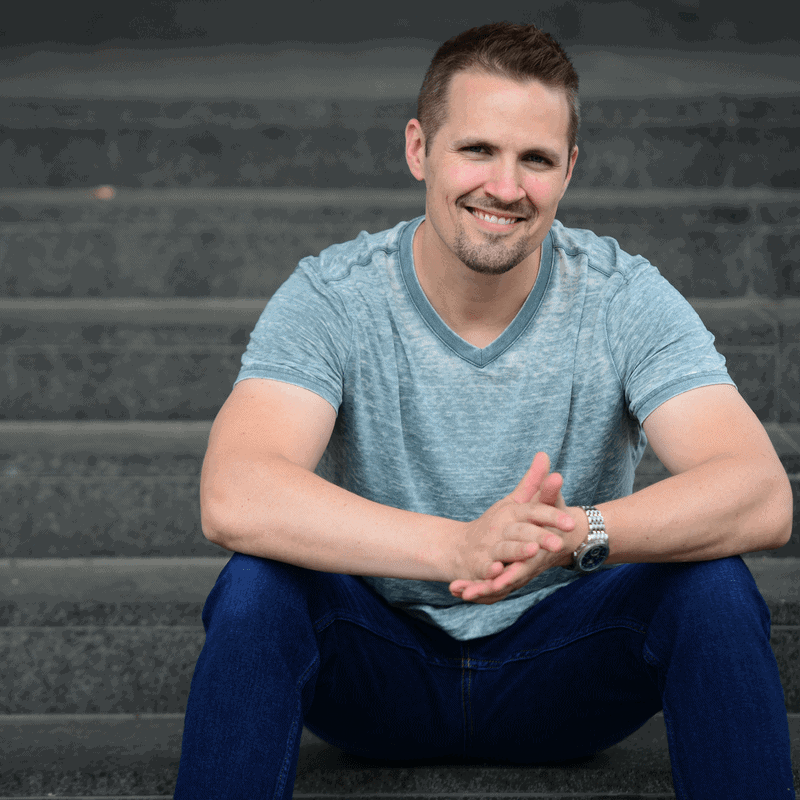 Of course, it helps that I can almost always offer seller financing as an option – which significantly increases my profit, as well as the number of people I'm able to work with. If the buyer doesn't have immediate access to funds, I can essentially become their bank (and I end up earning a lot more money in the long run anyway). When you put all these ingredients together, it creates a highly compelling selling proposition, which tends to generate a great deal of interest in the properties I'm trying to sell. Obviously, you can't reach out to your new neighbors until you know who they are and how to get a hold of them. Since your goal is to send each of these people a letter, it all starts with finding their names and mailing addresses (and remember, some of these people will be absentee owners). There are a few ways to get this information. This video below explains one way to do it with a service called DataTree. Once you have the mailing address for the surrounding property owner(s) you want to contact, it's just a matter of preparing your letter. Since your goal is to motivate your recipient to say YES, you need to be sure you're weaving a few key elements of communication and persuasion into your message. I used this format for about 3 years and it did a pretty good job of informing each recipient that the property was available to purchase (and I can only assume it gave people a feeling of “exclusivity”, i.e. – since they were truthfully one of a select few to receive this notification). While I never kept the exact stats on this particular letter, I would estimate that I got calls back about 20% of the time, which resulted in actual sales about 10% of the time. Also, keep in mind, this letter technically consists of 2 pages. As page 2, I would attach a parcel map and/or some other images of the property if they were available. Parcel maps do a great job of communicating exactly where a property is situated (including the size, shape and where the boundaries are situated in relation to neighboring properties). A good parcel map will help your recipient understand precisely what you're offering them and where it lies relative to their own property. 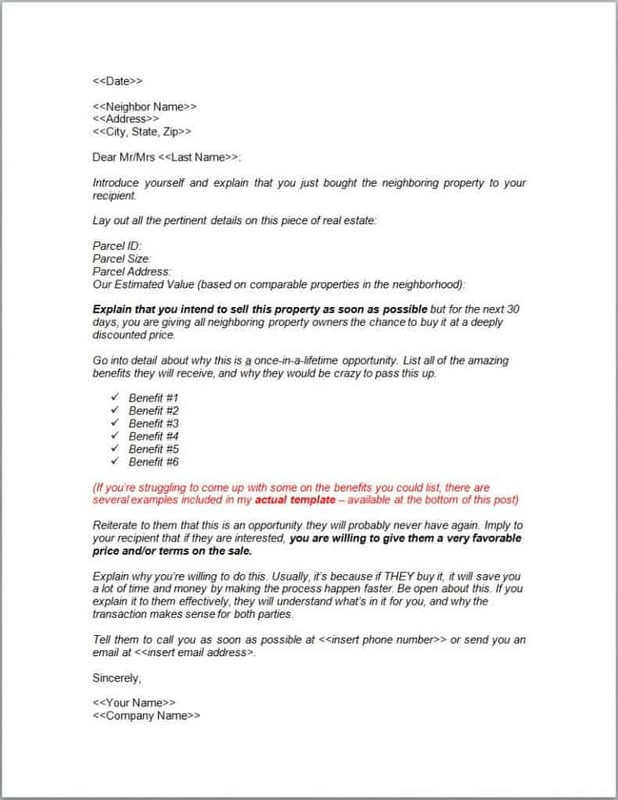 I always felt that this template was a significant improvement from my original letter, because it does a better job of identifying the specific benefits that will come with the decision to purchase, and it instilled a sense of urgency by identifying what the neighbor stands to lose if they DON'T purchase this opportunity. This is not a place for lying or scare tactics. The idea is to list some of the possibilities and reasons why if you were in their position, why YOU would want the same opportunity you're offering them. The benefits of purchasing (and the downsides of failing to act) should be 100% legitimate, realistic factors that you don't want them to overlook. Again, I've never kept any specific stats on this letter either (so I can't validate how much of an improvement it actually was) – but I would estimate that it generates closer to a 35% call back rate, which ultimately results in sales about 20% of the time. It should go without saying that these letters are NOT a “magic bullet”. You never know the exact situation of the person you're reaching out to. You could be offering them exactly what they've always wanted, or it could be that they couldn't care less. The key to success is to consistently send out well-crafted letters to every neighbor, every time. If you're seizing ALL of the possible opportunities, you will get results eventually. Is it worth your time and effort to contact these people, even if there are no guarantees that it will result in an immediate sale? Well, I can't speak for you… but after the first few sales it generated for me, I sure thought so! Is it worth an extra 10 – 15 minutes of your time to open up a few more doors for a potential sale? I think it's a no-brainer. If I can generate a faster sale even 5% of the time, why wouldn't I take that opportunity?? 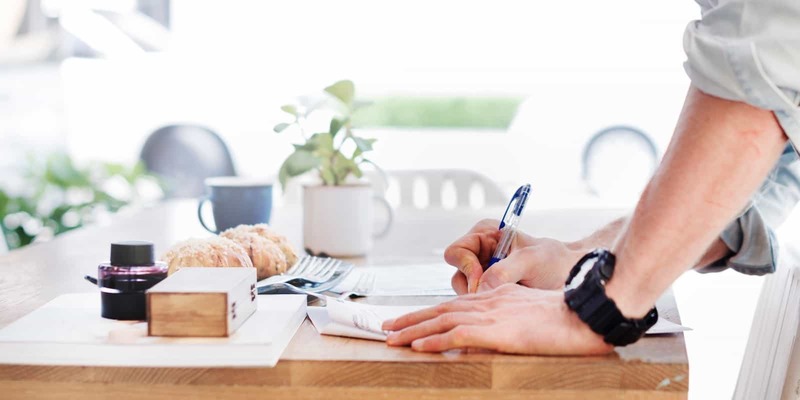 Considering how laborious it can be to sell some properties (and considering how much faster and easier this could make my selling process – all without the help of a real estate agent), these letters have become the #1 action on my priority list. Before I do anything else – I reach out to the neighbors. 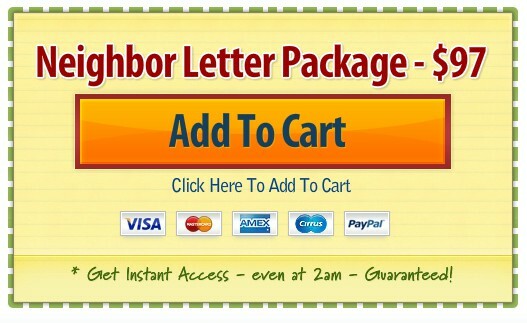 Want To Use My Neighbor Letter Templates? Similar to my blog post about my postcard templates, the examples above are only meant to show you the format of my neighbor letters, not the exact wording. You may very well be a better writer than me. With this in mind, I don’t want to dictate the way you compose your written communication. Remember… my letters have evolved quite a bit over the years, so I don't want to imply that my letters have the best copy ever written. That being said, I know from experience that it requires A LOT of time and mental energy to compose a well-written letter. If you don't have the time or desire to come up with something on your own and test it for years on end to see what kind of results you get – I understand where you're coming from. For that reason, I'll make this really easy for you. If you'd rather cut to the chase, you can purchase my exact, word-for-word templates below for less than the cost of a roll of stamps. BONUS: I'm also going to give you two additional templates that can be used if/when you're trying to BUY from a neighboring property owner. These take the reverse approach and can be particularly useful if you're trying to expand the footprint of a property you already own (rather than the other way around). Either way – I think you'll find that all four of these templates are some nice tools to have at your disposal when the situation calls for them. Note: When you sign up as an REtipster Email Subscriber, you’ll get instant access to these templates for FREE (along with a truckload of other free tools, calculators, video tutorials and more – as part of the REtipster Toolbox). No pressure of course – just want to make sure you're aware! This is great!!! I always find out some very interesting ideas I haven’t heard yet! Thank you for taking time for it! Thanks Elizaveta! Good to hear from you again! Hey there Hafilah – thanks for checking out the blog! Regarding your question above, I’m not sure I understand what you’re asking, can you re-phrase that? Are you asking for a letter that you will be sending out to others, offering to sell their properties via an auction that you will facilitate? Perhaps you could clarify the question for me. Please, i want your exact kind of your letter templates to my mail. Thank you. Hey Mr Danladi – all you need to do is subscribe to my email list and I’ll give you free access to it. Thanks! I would like to subscribe to your email list so that I can have access to the letter templates. Thanks in advance Seth…Lonnie D.
Hello Seth. I have subscribed to your newsletter and would like the actual templates/letters as I’m looking to sell part of my 6 acre parcel to neighbors that a-join my property. Thanks. Hi Ron – when you subscribed, you should have received a “Welcome” email from me with a link to the REtipster Toolbox. Check your inbox (and your spam/junk folder) for this email. If you still can’t find it, let me know and I’ll email you the link. That is really interesting information. Hi Katherine – thanks for your interest. All you need to do is submit your email address in the opt-in form above (or near the top of the page, in the right-hand sidebar). Thanks! Thanks for the comment Pejman, I’m glad you’ve found the blog to be helpful! Hi George – you can download the neighbor letter above, and if you’re looking for the initial offer letter I use (which usually comes into play prior to this step), you can find that here. Hi Cynthia – you could probably use these templates for that purpose (these are geared towards vacant land – but could easily be tweaked for houses and other types of real estate). We tried this with a property. No one was interested, it didn’t work. Thanks for your feedback Jay! Yeah, like I mention above… I’ve found it only works about 20% of the time – but if you’ve exhausted all your other options (or if you just want to test the potential of a fast and easy sale), it could be worth a try with every new property you’re selling. Where is the email opt-in? I would specifically like to see this neighbor letter. Just click the embedded link within the text above, and you should be able to sign up. Thanks for your interest!